THE SYSTEM - Rae Crowther Co.Rae Crowther Co.
Rubrics – Used by the coach, the rubric is the basis of evaluation from a performance and an academic standpoint. The rubrics for the “Big 100” exercises form the foundation of the system. Metrics – How much, how many, how fast, how far: The system incorporates multiple measurements to create accountability and responsibility in students and athletes in their daily training. Testing – The system uses The Physical Performance Profile to create baseline values of physical performance. 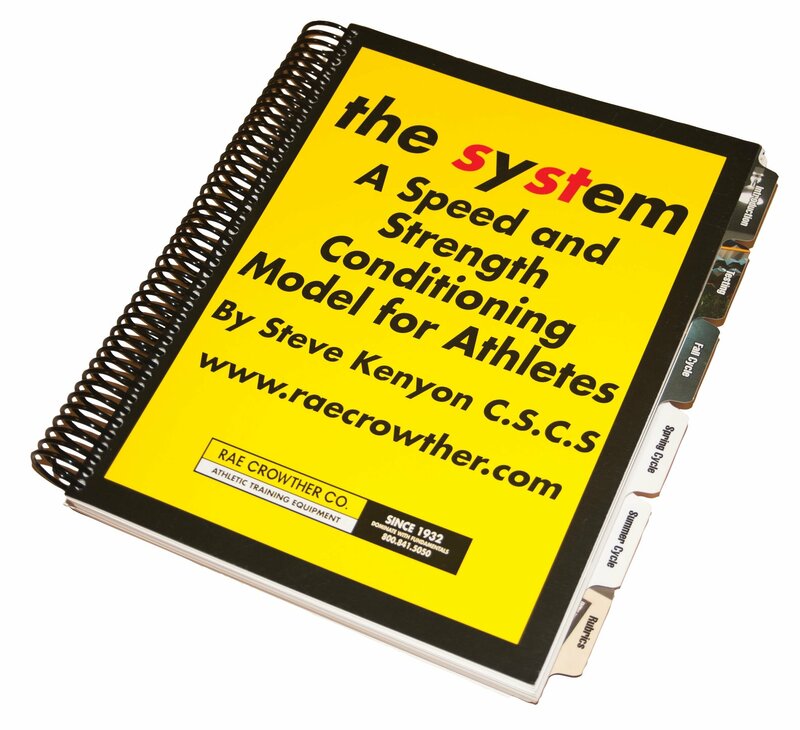 Performed in the first week of the fall and spring cycle, these tests give the coach, student and athlete the present level of performance for upper body explosivity (seated medball throw), lower body static explosivity (vertical jump), lower body dynamic explosivity (standing broad jump), lateral speed and agility (pro agiity) and speed (40 yard dash). Exercises And Video – There are ten exercises per unit of training. Known collectively as the “The Big 100,” think of these exercises as if they were the menu in a restaurant: A finite number of exercises that would be regularly if not randomly “selected” by the “customer.” Virtually all of the exercises are accompanied by video that shows the exercises in real time and slow motion, and multiple angles. These videos are accessed on line with a pass code that is included with the purchase of The System. Macrocycle – The system consists of a year round training program with weeks of active rest. There is a Fall Cycle that lasts from August 20th until December 20th, a Spring Cycle that lasts from January 10th to June 1st and a Summer cycle that starts on June 15th and ends on August 1st. Microcycle – There are five sessions per week in one Microcycle. Monday, Wednesday and Friday sessions are primarily weightroom based. Tuesday and Thursday sessions are typically designed for the indoor gym, field or track. Sessions – There are ninety sessions in a Mesocycle. The first five sessions of the fall and spring mesocycle include the Physical Performance Profile (PPP). The summer mesocycle does not include a PPP. It is a compilation of the “best of the best” 40 sessions. We have been using elements of the SST system at Cedar Grove for three years. We are a small school and a lot of our athletes play multiple sports. In the last two years, we have won two state track championships and been to the Quarterfinals and Semifinals in basketball. This year, we won the first state championship in football in school history. I can’t say enough great things about the SST principles we’ve used to improve athletic performance and to keep our athletes relatively injury-free. Huge thanks to Coach Kenyon! Go Saints!